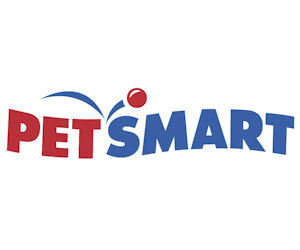 Best Animal Charities | Welcome To Your Pet Space! It is with a happy heart that I get to report on the goings on at the Conservators Center as a part of our spotlight on animal organizations. So many things have happened there since I last wrote The Story of Several Servals back in March that I thought it was time for an update. 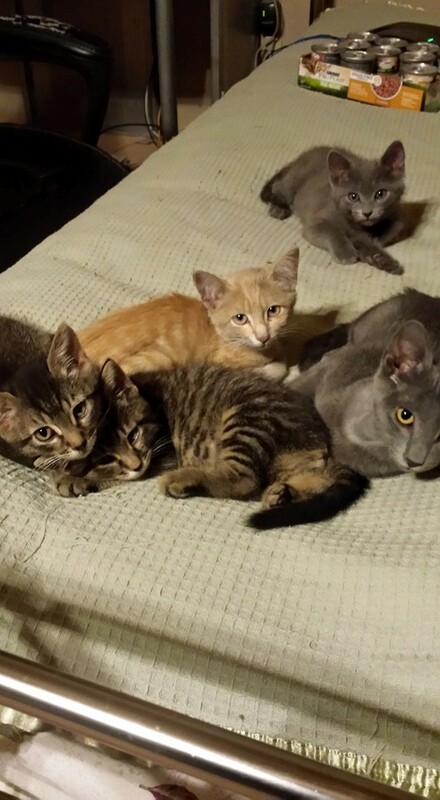 The folks at the Center have been very busy fighting the wording of House Bill 554, raising funds for the summer care of their animals (who have been painting up a storm), and welcoming a new member to their animal family. Below is a quick review of what is going on with my favorite place to meet Lions, Tigers, Wolves… and now, a Coyote! 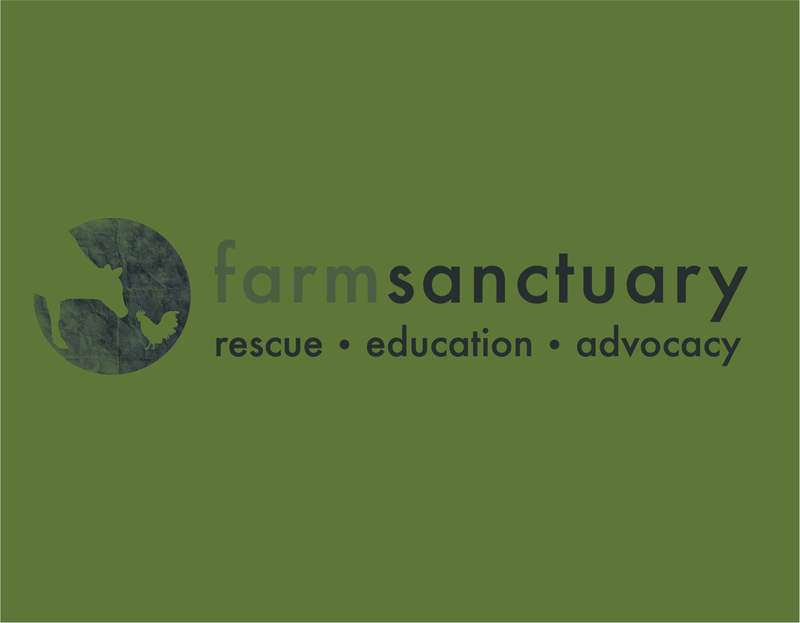 If you receive our newsletter, you might have seen that the Center was facing some serious concerns with a new bill (House Bill 554) which was intended to protect the public from harmful wild animals. 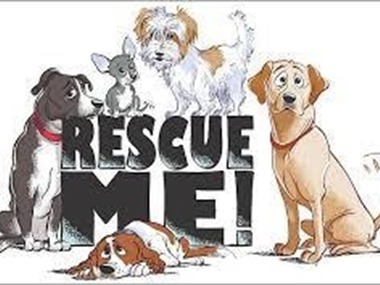 The issue with said bill continuing the way it was written was that it would require many legitimate organizations to shut down and could have led to the euthanization of some animals. Places like the Conservators Center, Duke Lemur Center, and other wildlife sanctuaries open to the public would no longer be able to function under the conditions specified, since they give guided tours of their facilities in order to help raise funds to care for the animals, as well as to educate and promote conservation. After many polite emails to all the right people and much discussion of the bill on voting day, it was announced that the bill would be reworded and that the Conservators Center and other facilities with the same purpose would not be forced to close. There are still a few issues with the bill as it has been changed, mostly related to technical language and industry concepts that are hard to negotiate, but as it stands, the Conservators Center and many similar places around the state can remain open and active. If you wrote to your legislators, I thank you, and I know the Center thanks you as well. 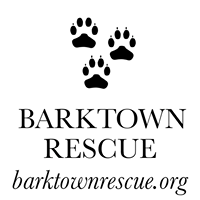 At around the same time, a small pup was found along the side of a local road and taken in by some well-intentioned people who thought they had found a feral dog. At the first visit to their vet, they were in for quite a surprise when they discovered they had a small coyote on their hands. 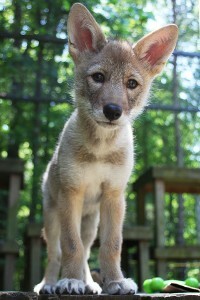 Sadly, because it can be easy to mistake a coyote pup for a coyote-dog cross or for a feral dog, the coyote had been taken into the home of humans and treated as a puppy would be and it was impossible for him to be re-released into his wild home. It wasn’t long before the Conservators Center was contacted and the pup was given a new home, with trainers and handlers who are used to working with wild animals. 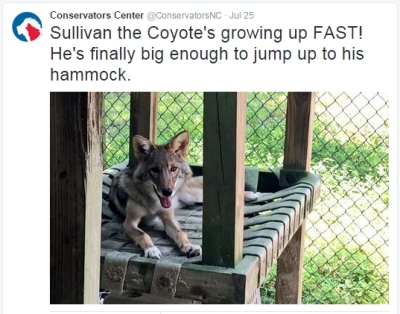 The Conservators Center had a naming contest for Sullivan as a part of their summer costs fundraising campaign and one lucky person who donated got to pick the perfect name. Over time, the Center has posted videos of Sulli playing and howling with his handlers. Regular followers on Facebook and Twitter have been able to watch him grow and there is certainly no doubt that this little guy is a coyote! Both playful and handsome, he has begun greeting visitors and is available for lifetime adoption. I cannot wait to get out and meet him next time I go through on a tour. This time of year is comfortable for the lions and some other animals who live at the Conservators Center and are used to a warm climate, but for the tigers, binturongs, and others, heat is not a condition they would regularly be familiar with. It takes a lot of work and effort to help keep these animals comfortable in the hot summer months in the southern state of North Carolina, where we don’t just deal with heat, we deal with humidity and heat indexes that can get over 105 on any given day. This is a time when the Conservators Center needs a lot of help in the form of donations. From July 23rd through September 4th the Conservators Center is teaming up with the Alamance County Arts Council to produce an exhibit of over 50 pieces of art created by the animals at the Center. These aren’t just paw prints on paper, these are beautiful masterpieces, blending color and texture onto real canvases. How do they do it? The humans at the Center base coat the canvas with a safe tempera paint, let that dry, then add liquid paints enhanced with smells that the animals like (cinnamon, perfume, etc) and allow the animals to rub, sniff, and otherwise interact with the canvas as they would with an object in nature that stimulated their senses. 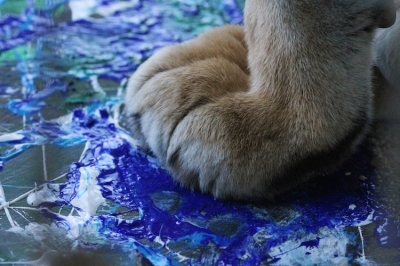 Sometimes you get claw or tooth marks along with the prints from the fur, but that is all part of each animal’s interaction with their canvas. 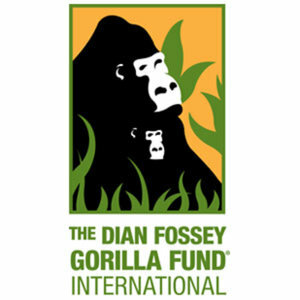 This is an enrichment activity that the humans are specially trained to administer and is fully enjoyable by the animals. No one is ever forced to paint and the activity has been going on for ten years now. Ugmo Lion and Kira Lion are different in a lot of ways. Ugmo is enjoying her golden years; Kira is still in the prime of her life. Ugmo was rescued from a negligent breeding facility in 2004; Kira was entrusted to the Center by a reputable zoo. They even live in separate enclosures, but they have one thing in common: both of them live with an extrovert! Ugmo’s roommate, Kiara, is a social butterfly, quick to greet her favorite human friends and receive endless amounts of attention. And Kira’s roommate—Arthur, a white tiger—is the star of the Conservators Center. But Ugmo and Kira don’t mind. Most of the time, they can be found lounging in the back of their enclosures, looking on with soft smiles as their bright, unreserved roomies ham it up in the front. 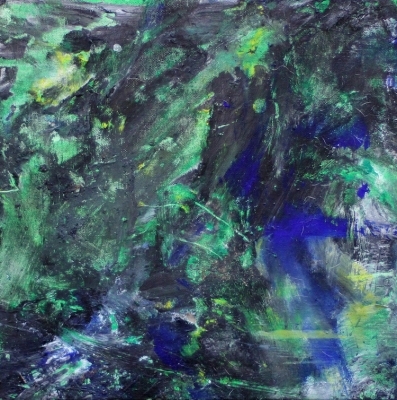 This painting is an exploration of the joy of introversion: the luxury of resting quietly in dark shadowy places, with no pressure to perform or act outside of one’s nature—and how wonderful it is to know you are just as valued and adored as your more gregarious counterparts. 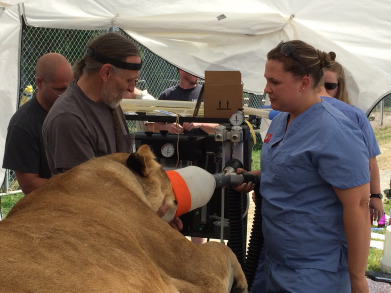 The last of the major events that has happened at the Conservators Center was a surgery for Kiara Lion, who was slowly changing in her old age. Her temperament wasn’t what it used to be and the folks at the Center requested the help of Dr. Doug Ray from the Animal Hospital of Mebane. With the help of students from the North Carolina State University College of Veterinary Medicine, Dr. Doug performed a spay and exploratory surgery in order to be certain that her hormonal imbalance could be corrected and her emotional state set to the right place again. Doug teaches Sarah about the anesthesia machine. It was donated by a dedicated group of Lifetime Adopters who wanted to ensure good surgical outcomes for our geriatric residents, who are the most at risk when we must administer anesthesia. This is yet another example of the wonderful opportunities that the Conservators Center makes possible for education and outreach. It is because of this wonderful group that the Carnivore Team at NCSU were able to participate in a big cat surgery, and it is because of this same group that members of the community get to meet Kiara and all of the other animals that would normally be so far from us. For these things and so much more, many members of the animal kingdom and animal lovers everywhere are forever grateful. The full story of Kiara’s surgery can be found on their website. All images and image descriptions are used from the Conservators Center website, with permission on the condition that we give credit to photographers as was noted. 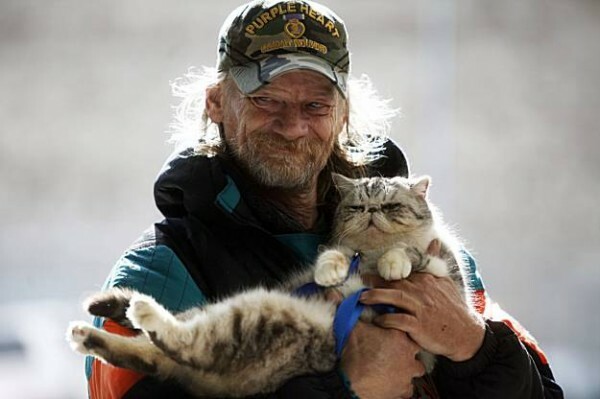 Shortly after Dave and I moved to New Mexico, I began noticing how many of the homeless people here have pets with them. There’s a mission here in town that we visited about six weeks after we arrived. They have a food kitchen, and we wanted to take some donations there for Thanksgiving dinner. Next to the food kitchen was an office where people needing work could sign up to be helped. And outside, along with all the downhearted, poverty stricken people, were their pets. 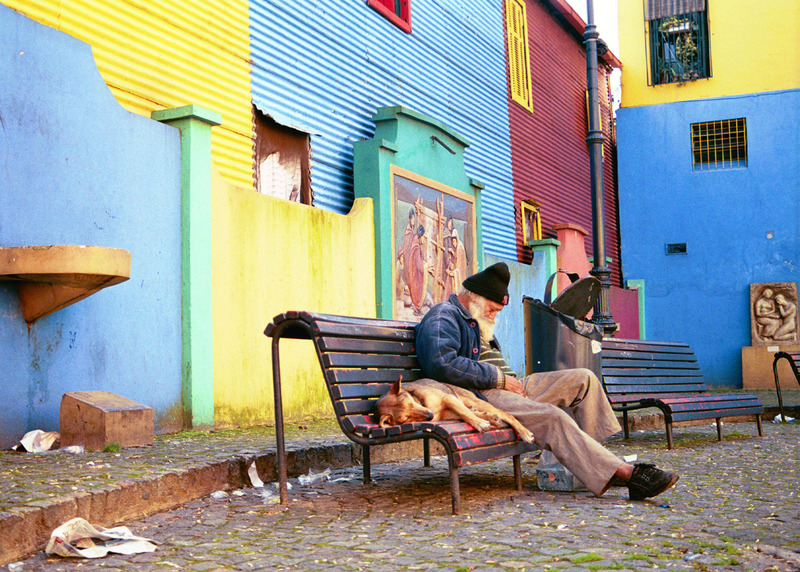 A few weeks after that, we were exploring a new part of town, looking for a particular store in a strip center, when a homeless man walked by carrying a guitar…and at his feet walked a perky little puppy, head held high–just like any other dog, happy to be walking at his master’s side. Most recently, Dave and I went to the local farm coop store where we buy our humanely produced meats and organic produce. 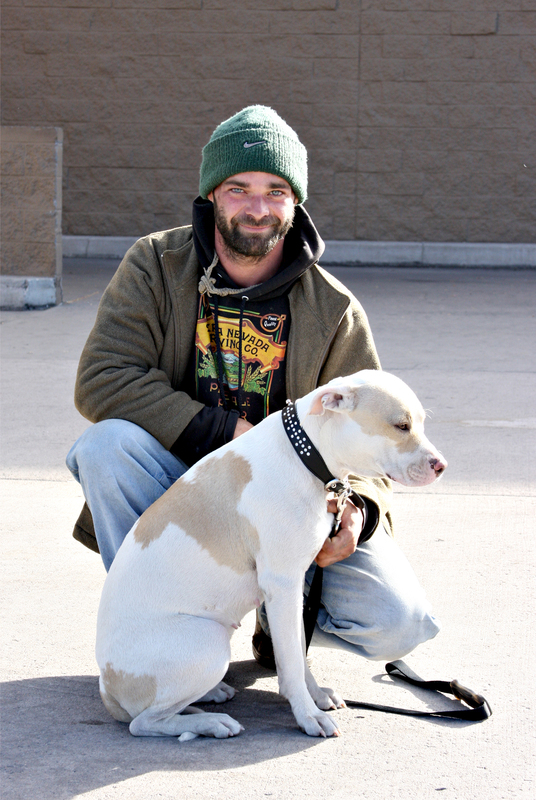 Outside on that particular day, enjoying the warm February weather, was a homeless man and his two dogs. We’ve all read the stories of, and some of us may even personally know, people that had children hoping to be loved. Then the children went on to betray or disappoint the parents. In some cases the children are even abused or neglected–all because human beings seldom are able to fulfill the expectations others set for them–love not withstanding. But the love of a pet doesn’t work that way. Without judgement or agenda, against all odds and reason, they simply love. And for the homeless, this may be needed most of all. Meet Chris and Brandy. 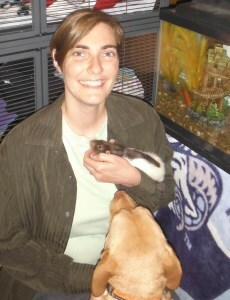 Chris is very protective of his pet, since a previous dog was taken by Animal Control because she was unlicensed. Where Do The Homeless Come From? Statistics tell us that in the U.S., more than 3.5 million people experience homelessness each year. 35% of the homeless population are families with children, which is the fastest growing segment of the homeless population. 23% are U.S. military veterans. But…who are they really? I saw an interview once with Neale Donald Walsch, the author of the Conversations With God series. In it, he revealed that he had spent a year on the street as a homeless person. Before, Walsch worked variously as a radio station program director, newspaper managing editor, and in marketing and public relations. In the early 1990s he suffered a series of crushing blows—a fire that destroyed all of his belongings, the break-up of his marriage, and a car accident that left him with a broken neck. Once recovered, but alone and unemployed, he was forced to live in a tent in Jackson Hot Springs, just outside Ashland, Oregon, collecting and recycling aluminium cans in order to eat. At the time, he thought his life had come to an end. What’s important to remember is that in a world where one missed paycheck, an abusive spouse or a serious medical condition can put someone out of their home, not every homeless person is dangerous or lazy. 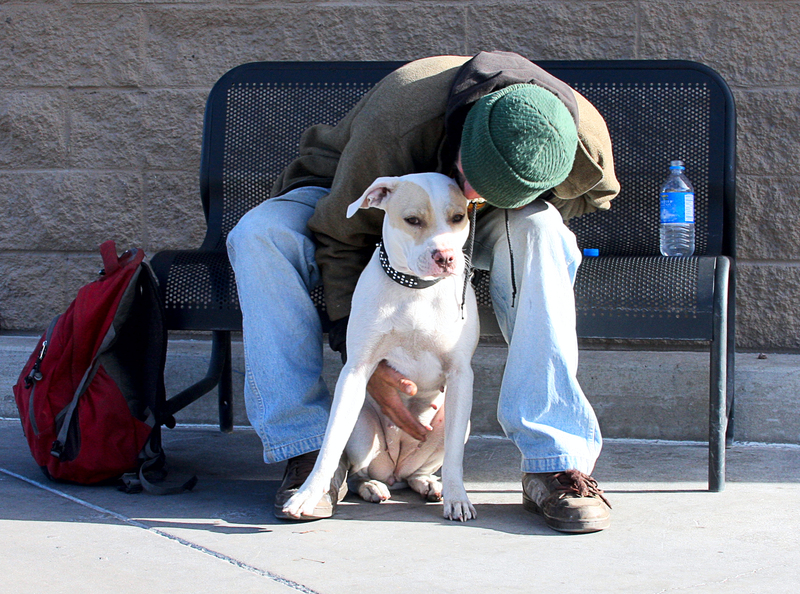 How Many Homeless With Pets Are There? 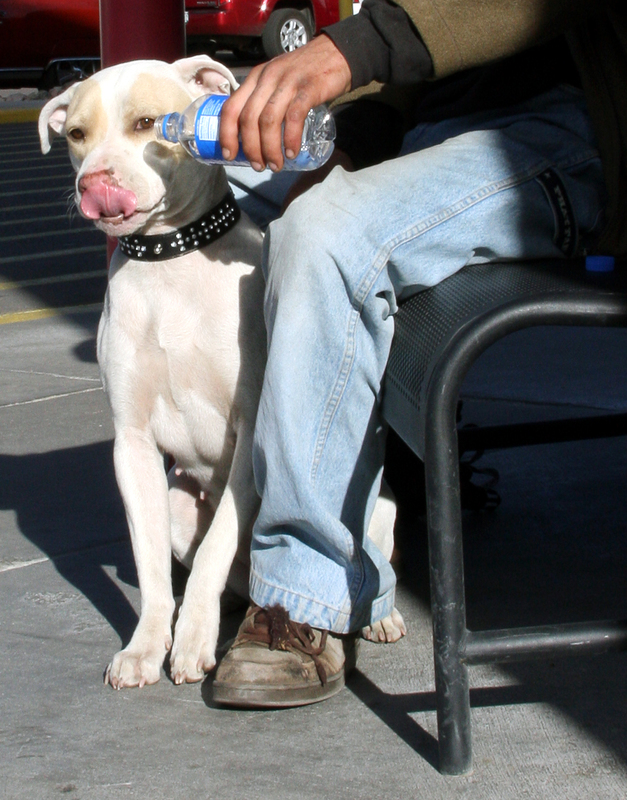 The National Coalition for the Homeless estimates that between 5%-10% of homeless people have dogs and/or cats. It could be more like 25% in rural areas. These numbers may differ across the country due to a number of factors: weather, the local economy, and the cost of living. 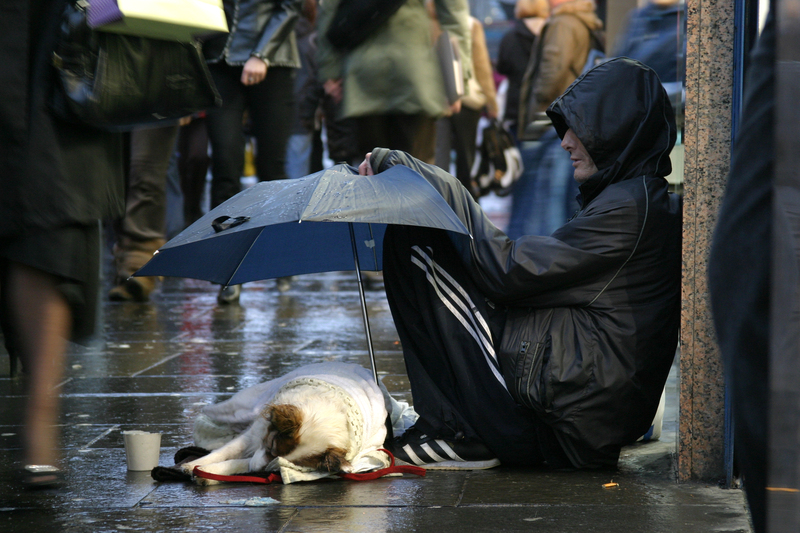 How Can The Homeless With Pets Care For Them? When I saw the man at the shopping center, though, the first thing that struck me was how the dog didn’t know its dire situation. He just pranced along in the sunlight, happy to go wherever his man went. But I wondered for a long time after we gave him money for food, how the man would prevent fleas or heartworm for this wee puppy. What would he do if the dog were injured? 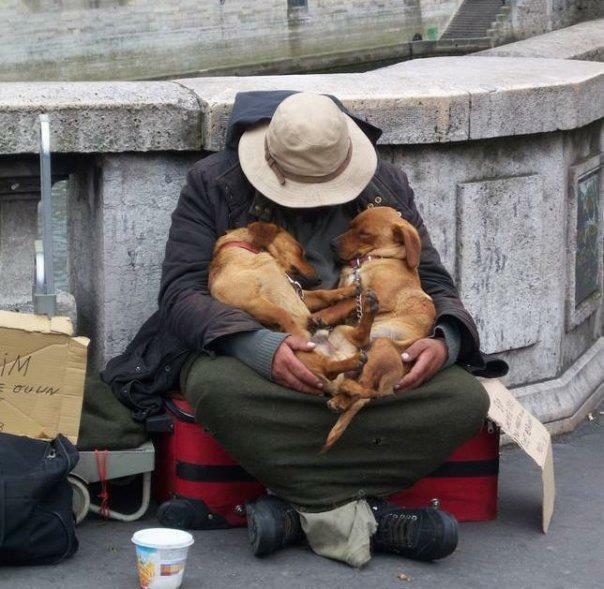 Even the kindest benefactor often won’t approach a homeless person on the street to offer help for their pet. And many homeless are fearful if they accept, their pet will be taken away from them. Often, their pets are the only comfort they have, and their only link to reality. Luckily, there are organizations that can help. Chief of these is Feeding Pets Of The Homeless. 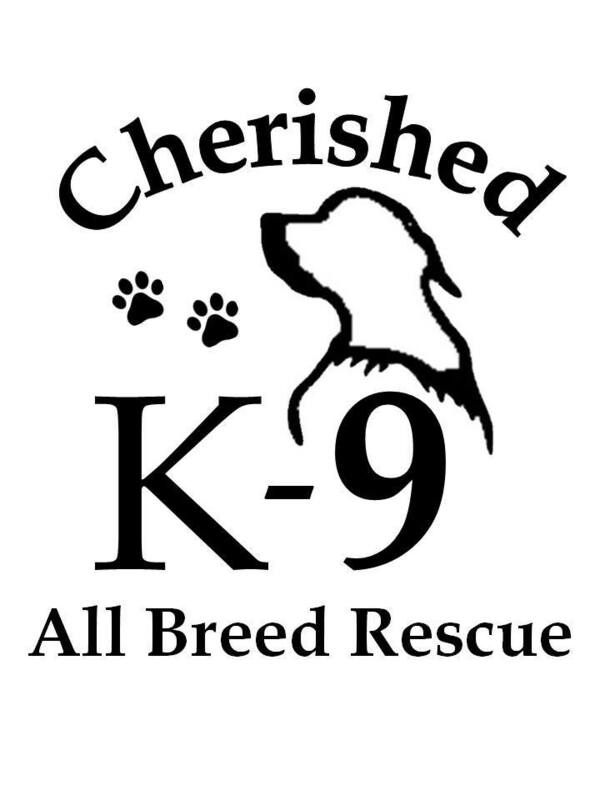 They are a nonprofit volunteer organization that provides pet food and veterinary care to the homeless with pets in local communities across the United States and Canada. 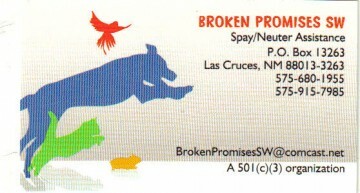 For us here in Las Cruces, New Mexico, the local agency that distributes food and medical care for pets of the homeless is Action Programs for Animals, whom we have worked with in the past and plan to again in future. If your city isn’t listed here, Feeding Pets Of The Homeless has an awesome search feature on their website. Word of mouth travels quickly in homeless communities. Once a food bank or soup kitchen starts distributing pet food, they come. 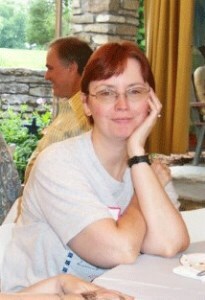 Some find out about the programs through the websites by accessing the internet at public libraries. It is our sincere hope that someone reading this post finds the answers they seek here.